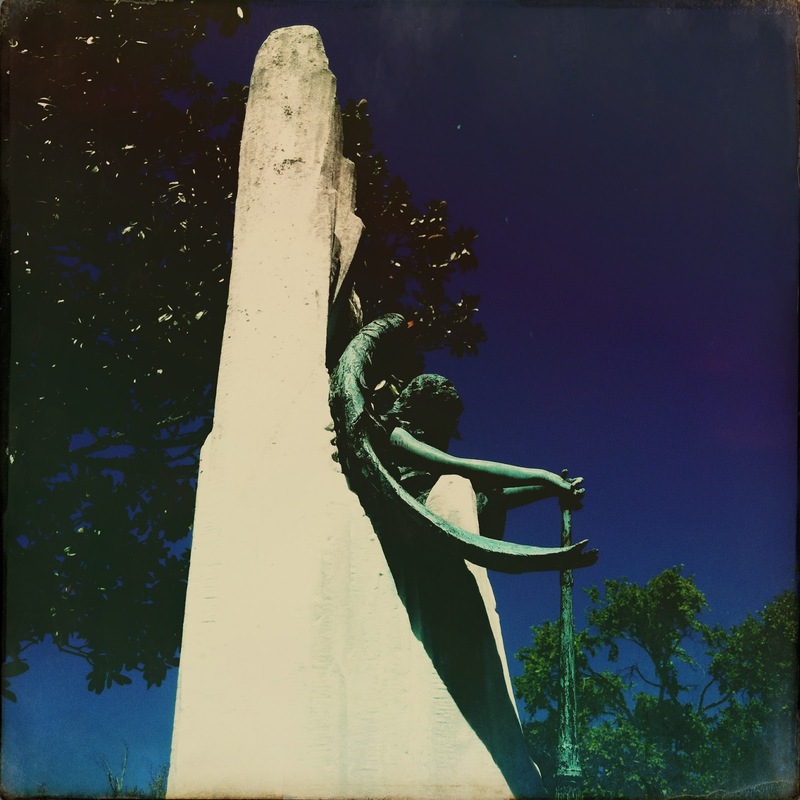 Janie Sutherlin Smith Barrett’s monument is located in the Sutherlin family square in Green Hill, a towering, bright contrast to the sea of mostly gray tombstones surrounding it. 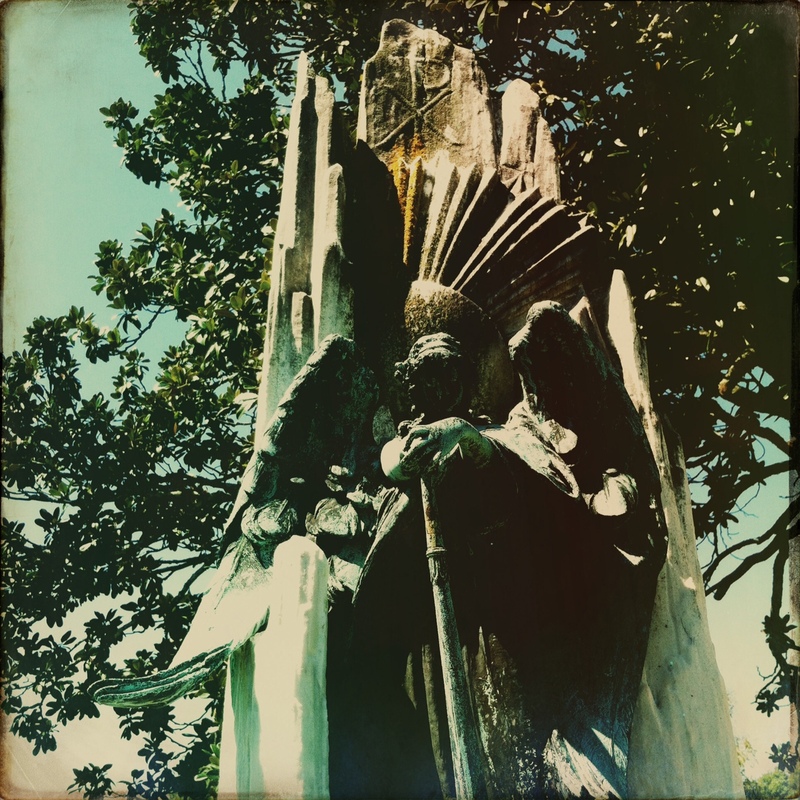 The green appearance of the angel is due to patina on the bronze, which makes the marker even more beautiful (in my opinion). I’ve started researching Janie more than once only to put the project on hold due to confusion among the “Janies/Jannies/Janes” in this family. 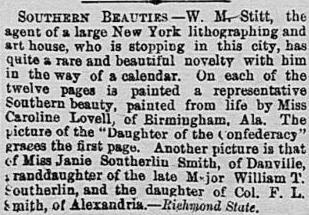 This particular Janie was the daughter of Francis Smith and Jannie Lindsay Sutherlin Smith. Jannie Lindsay was the daughter of Maj. William and Jane Patrick Sutherlin of Danville, Virginia. 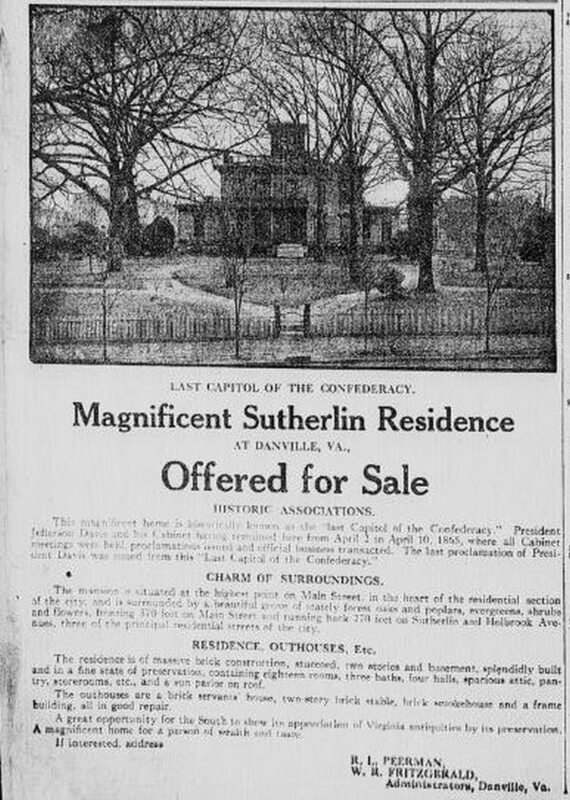 The Sutherlin home still stands today as The Danville Museum of Fine Arts and History. According to the museum’s brochure, when Janie was four years old in 1876 her parents returned to the Sutherlin mansion where the couple’s third child was to be born. (The second child died in infancy.) Jannie and the baby died during childbirth, which was frighteningly common in the 19th century. 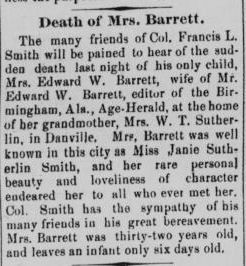 For whatever reason, Francis Smith left Janie in Danville to be reared by her grandparents. The Sutherlins hired a live-in teacher for their granddaughter, but aside from that and a few blurbs in the society pages of newspapers, I wasn’t able to find out much about Janie’s life in between her birth and the time of her engagement. 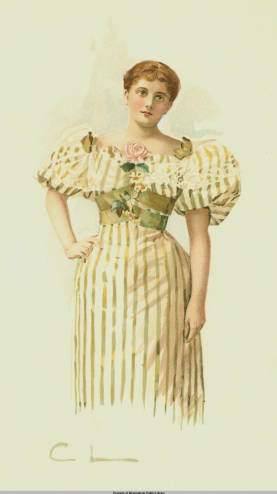 In July 1895, Janie went to Europe for three months. Not long after her return to the United States, her engagement to Georgia-born journalist Edward Barrett was announced. Janie’s name was mentioned in an 1896 newspaper in reference to an illness that she recovered from at her grandmother’s Danville home. As of the 1900 census, Edward, a newspaper editor, and Janie lived in Birmingham, Alabama with four servants. According to this record Janie hadn’t given birth to any children during the first five years of the marriage. 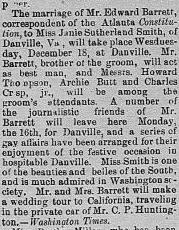 In October 1904 Janie gave birth to the couple’s only child, Janie Sutherlin Barrett in the Sutherlin’s Danville home. Unfortunately, Janie (the mother) died six days after the birth on November 2 at the age of thirty-two. 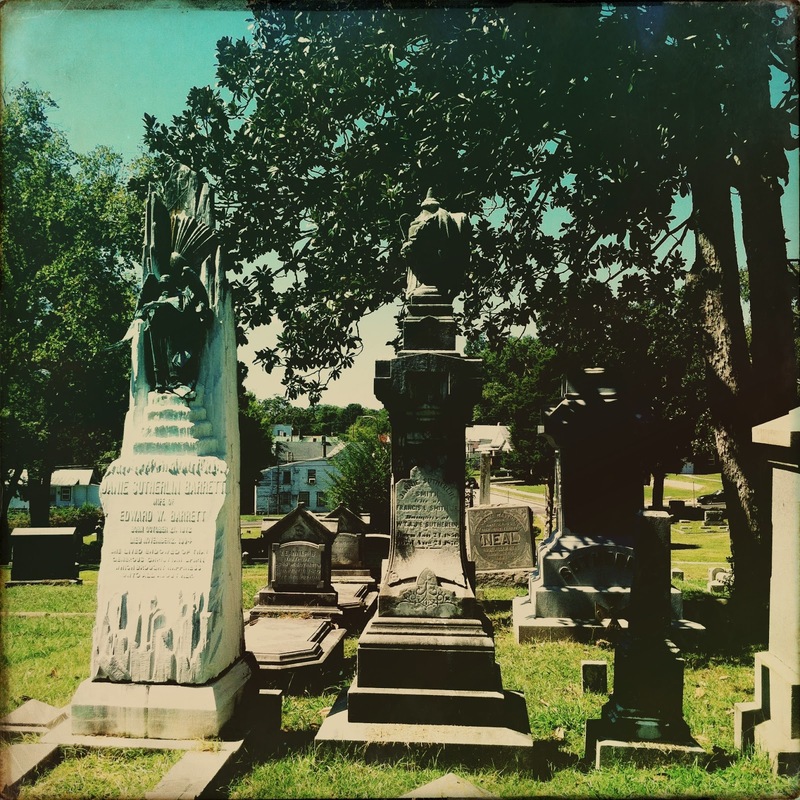 She was buried in Green Hill beside her mother in the row in front of her grandfather’s grave. Edward and the baby returned to Alabama. When Mrs. Sutherlin died in 1911, seven-year-old Janie inherited the mansion. At that time the home was put on the market. 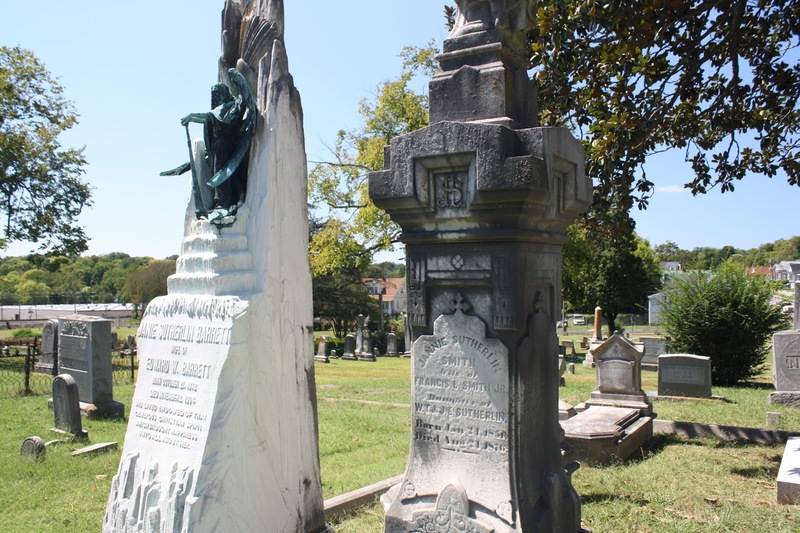 According to the museum brochure, the Confederate Memorial Association played a key role in preservation efforts. Janie married Julian Jordan, Jr. in 1923 in the mansion’s parlor-the same room where the weddings of both her grandmother and mother took place. I visited the Sutherlin mansion over the summer during a mourning exhibit commemorating the death of William Sutherlin, so I’ve seen most of the home, including the parlor. After having sorted out the births, weddings, and deaths that occurred there, I’d like to go back in order to link mental images of specific events to the rooms in which they occurred. I heard that she was related down the line to my husband (Barrett) loved to read about her here! Thank you for leaving a comment! It's always nice to hear from descendents of the people I've written about. Previous Previous post: Murder or Death By Drunken Fall?